"The boxing business must rid itself of the evil influence of racketeers and crooked managers, even if it takes an Act of Congress to do it." Boxing has always been one of cinema's most dependable and durable backdrops with such crowd pleasing classics as The Champ, Body and Soul and Rocky collecting honors in the heavyweight division at the box office. Although it didn't rake in as much moolah as the tales of Rocky Balboa and Charlie Davis did, The Harder They Fall ranks among the best boxing films and one of the few that dares to take on the seedier side of the sport. Based on the best selling novel by Budd Schulberg (which served as the basis for Philip Yordan's excellent screenplay), it's a hard-hitting tale of shameless and corrupt boxing promoter Nick Benko (Rod Steiger), who earns tidy profits by using unsuspecting 3rd-rate fighter prospects as sacrificial lambs, building up their confidence in fixed bouts only to set them into major title fights with championship boxers whose skills far outweigh those of their underdog opponents. In the midst of setting up his next patsy, Nick hires former sportswriter Eddie Willis (Humphrey Bogart) to play publicist for his latest prot�g�: Toro Moreno (Mike Lane), a bear of a man who just about matches the Empire State Building in height and possesses the build of an ox. But that's where comparisons with the likes of Joe Louis end. Cursed with the boxing aptitude of a cream puff, even Shemp Howard could sucker punch Toro into next week. Wary of getting involved in a scheme that goes against his principles, the chance to escape a meager paycheck to paycheck existence proves too good for Eddie to pass up, or as he bluntly puts it, "When a man passes 40, he shouldn't have to run anymore." Cleverly side stepping the heat and glare of a harsh New York press, Willis and Toro's camp begin their tour of deception in L.A. with a low profile bout serving as a test run. Although the fans in attendance suspect nothing of a pre-determined nature at the end of the fight, what Eddie doesn't count on are accusations of a set-up from local sportscaster (and former Big Apple colleague) Art Leavitt (Harold J. Stone). Out of loyalty, Leavitt offers to stay mum but not before showing Eddie a haunting piece of celluloid: An interview with a former boxer cut from the same stone as Toro, who's become a mere shell of his former self. Willis can hardly bear to watch as a nearly incoherent, mostly toothless and now penniless former athlete struggles to keep up his end of the conversation. Yet the media machinery presses onward with Toro becoming a rags-to-riches sensation. And as the paydays get bigger and a title match looms in the distance, Eddie wrestles with guilt knowing that the charade will end in a bloody and potentially life-threatening epilogue unless he opts to tell the bulky Argentinean the truth. 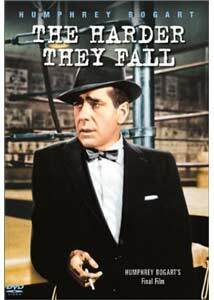 Compelling storyline aside, The Harder They Fall its propelled to another level via an amazing set of actors led by the incomparable Bogart in his final screen appearance. Showing little or no signs of the cancer that would soon claim his life, his intensely edgy yet affable screen persona remains as solid as the glory days of Casablanca and High Sierra. Matching Bogey for sparks is the fiery Rod Steiger, then at the peak of his youthful vigor. Fresh from the triumph of On The Waterfront, Steiger's confrontational scenes with the elder Hollywood statesman provide many of the film's high points and at times prove more exciting than the fight sequences. Also making significant impressions: Former boxing champions Jersey Joe Walcott (as Toro's trainer) and Max Baer, Sr. (the take-no-prisoners heavyweight champion who can't be bought off); early screen appearances by some of the best character actors in the business (Stone, Edward Andrews, Nehemiah Persoff, Herbie Faye and Jack Albertson) and a terrific debut by Lane as the clumsy yet endearing Toro. Also meriting mention is the film's noir-ish camerawork by Oscar�-winning cinematographer Burnett Guffey (From Here To Eternity, Bonnie And Clyde) that gives the proceedings an almost documentary-like feel, particularly during the sequences filmed on location in New York. Image Transfer Review: Suprisingly good transfer given the film's age. About the only problem I noticed were certain sequences had some intermittent flashes of white specks here and there that were distracting in the beginning but lessen somewhat as the movie progresses. Audio Transfer Review: Phenomenally crisp mono audio that belies its vintage with surprisingly good low end; practically no hiss or crackles that marred many a television print of this film. The Bogart Collection: 4 minute montage of theatrical memorabilia from Bogart's Columbia Pictures films. Extras Review: Frustratingly sparse, but there is a nice 4-minute montage of posters and lobby cards representing Bogart's Columbia Pictures output. Trailers for boxing-themed films On The Waterfront and The Greatest are contained, but surprisingly, none for Harder itself. Wouldn't it have been cool (or as Bogey would say, "swell") if a commentary track from author Schulberg (who's actually been involved in a couple of recent documentaries on Turner Classic Movies) had been included or a featurette with surviving cast members on what it was like working with the lengendary actor? Like Bogart himself, The Harder They Fall goes the distance.